Join us for this AMAZING eye-opening Art-Venture tour to this ancient city of Jingdezhen, Jiang Xi Province, one hour south west flight of Shanghai. From Shanghai we fly direct to Jingdezhen and our tour starts on collection from the airport. We visit the ancient Customs Park where we see first hand the production from skilled master potters, throwing porcelain wares. This unique tour helps you undersatnd the history behind China's oldest art form. 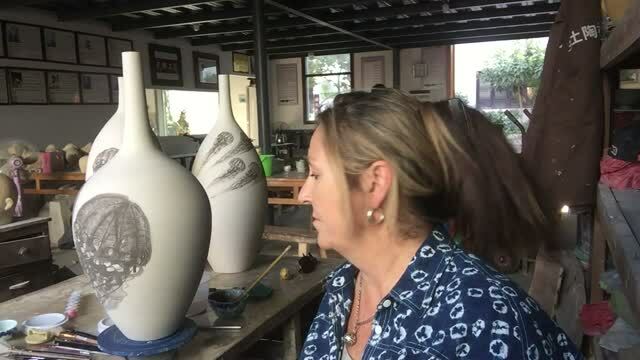 Later you can try your hand at porcelain glazing or porcelain wheel-throwing or hand-building your own project, under the instruction of professional ceramists. The surrounding landscape is picturesque and the cobblestone laneways through ancient villages are perfect for photos and sketches. Experience the crystal clear waters of Yaoli alongside tea plantations and traditional glazing mills. Meet artists and craftsmen selling their wares at the Friday night porcelain market and Saturday outdoor Artist's Bazaar. We stay at the 4 Star Traders Hotel 3 nights, and all flights, meals and accommodation is included in the trip. Scan our Wechat QR code to contact us or more information, or email us HERE!